The United States team is ready for the women's rugby sevens debut in the Olympics. Julie Foudy of espnW gets on the field to learn how to play. Jessica Javelet never wanted to play rugby in the Olympics. And while she may be a crucial part of the USA seven-a-side team premiering in Rio this year, she always had a rather different Olympic dream. Up until a few years ago, she was expecting to represent her country on the global stage in field hockey. "When I didn't make the 2008 roster for Beijing and then stopped playing, I thought that my Olympic dreams were over," she says. "I thought I'd missed out on that dream. To come back and try and have a second chance at it is something I never even thought would be possible. I'm really excited to have this second opportunity." Perhaps it's unsurprising that Javelet -- JJ to her friends -- never had rugby in her plans. The sport largely flies under the radar in the U.S., dwarfed by the more traditionally popular team sports. And across the world, rugby has typically been played by men, with women's teams coming as a relatively late addition. Seven-a-side rugby has been established for more than a century, but with smaller teams and shorter playing times, it's often in the shadow of its 15-a-side sibling. When compared to Olympians who have trained for their sport since they were children, many of the players who will be wearing the USA shirt this summer came to rugby relatively late in life, typically after successful high school and college athletic careers in another discipline. Javelet, 31, only got into rugby after a former hockey teammate suggested it to her. She was looking for a new sporting challenge after putting her stick away and tried football for three years before being invited to a rugby camp. It was love at first hit. Megan Bonny, 26, and Kelly Griffin, 29, each played rugby for the first time in college. Both had competed in track, soccer and basketball as teenagers, and both wanted a new sport to try. "I was really looking for something to do," says Bonny, "and rugby was a fun new opportunity. It was at the time something to get me active again and be social, and it turned into something that was really good for me. It really pushed me to get motivated in school, be motivated in getting to the next level in rugby, and it's been a really big thing in my life." But when Bonny and Griffin started playing, neither had expected that they would get the chance to go to the Olympic Games. Rugby sevens' addition to the list of Olympic events was confirmed only in 2009. 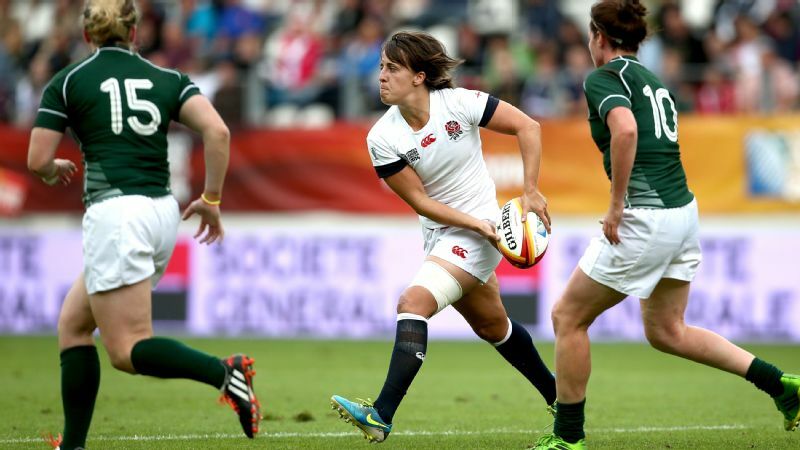 "When rugby was announced as going to be included in the Olympics in 2009 it was like, 'Oh!'" Griffin says. "It was like this might go somewhere, but at that point, a long shot. Fast forward a couple of years..."
Griffin is quick to stress that rugby is slowly gaining a higher profile in the U.S., with academies and camps springing up all over the country, and points out that this is reflected in the demographics of the squad going to the Olympics. "There are a couple of girls on our team now who are in high school or just graduated from high school -- they started playing in eighth grade. "They're maybe five or six years younger than we are -- well, more for me," Griffin says. "We're just a little bit older, but rugby is starting to take off in high school." Megan Lee Bonny of United States in action against New Zealand during the Dubai Sevens, the second round of the HSBC Sevens World Series at The Sevens stadium on November 28, 2013 in Dubai. 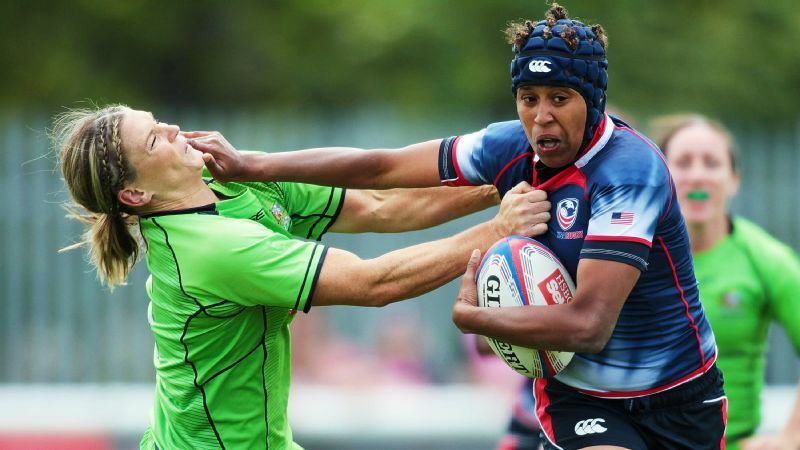 Participation -- male and female -- in rugby in the U.S. increased by 81 percent from 2008 to 2013, according to the Sports & Fitness Industry Association. According to USA Rugby, about one-third of the 1.13 million players in 2009 in the U.S. were women. And since then, the sport has grown massively at collegiate level, with more teams going full varsity. The players of Team USA think that's an incredibly positive development. "We would like the American public -- boys and girls -- to start getting exposed to it earlier on so we can get top athletes to start playing rugby and continue playing," says Javelet, "so that's something we're really hoping for with the Olympics -- we get all the live coverage and we generate a lot of interest from younger players that want to start getting involved." The late blooming of rugby in the U.S. could serve as a disadvantage to the in the Olympics, but it's not a roadblock. The team finished fifth in the 2014-15 Women's World Sevens series, a competition between national teams in rounds across the globe. They had a good showing in Atlanta in April, winning five of six games in that round, but they ended up sixth in the rankings after being narrowly defeated by France 19-22 in the final round. It was Australia who picked up its first sevens title in that series -- the first team to manage to wrest the championship from New Zealand. Those two neighbor countries are looking like the teams to beat in Rio. The USA squad has also had an eventful build-up to their Rio preparations. The team has now had three head coaches in the span of a year: Jules McCoy left her position as coach in April after her second spell in the role. The new coach, Richie Walker, had previously been the assistant to Ric Suggitt, who had been replaced as coach by McCoy in September. "Richie is an obvious choice to move the team towards the goals laid out for Rio," USA Rugby director of performance Alex Magleby said in a statement after Walker's appointment, adding: "We need minimal disruptions moving forward." And Javelet, for one, announced her surprise departure from the international scene following the 2015 Canada Sevens tournament before returning six months later after McCoy's appointment. Griffin, the squad's captain, is keeping her team focused. Speaking over the phone, the players' camaraderie is evident, with laughter in the background alongside jokes and teasing as they talk. The squad are based at the Olympic Training Center in Chula Vista, California, a year-round facility dedicated to maximizing teams' performance across sporting disciplines. "Realistically, we're together almost every single day," Bonny says. "Even on our off days, we're coming in here for treatment." Says Griffin: "Or we're like, 'Hey, let's go get lunch!' -- all the time. Or, 'You wanna go to a movie?' We hang out every single day, let's hang out on our off days! A lot of us live together, we're roommates. We're pretty close. It helps with the team chemistry. Everyone is really great." And being Americans, they take winning very seriously. 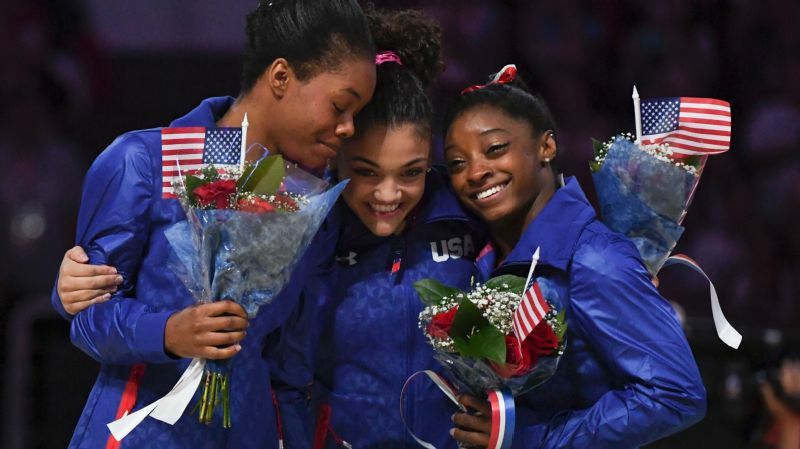 In a brand-new event they have the chance to make their mark -- and bring home medals. The American rugby players have been inspired by their soccer-playing equivalents -- not just the current World Cup holders and Olympic gold medalists, but the legendary team of 1999, who won the World Cup on home turf after a dramatic penalty shoot-out, and seared the image of a celebrating Brandi Chastain on to the memories of a nation. "I know the '99 World Cup was really influential for a lot of us," says Griffin. "That's when we were kids, in middle school. My parents took me to those games and that was really inspirational for a lot of us to see that, to be like, 'Look at them, I want to do that, we can do that,' and that continues to be an inspiration to us going forward." Griffin is unafraid to say she is hoping that her team will challenge for the gold medal this summer, but these women also have a long-term view. They are pleased that there will be a U.S.-based professional league for their male counterparts -- and they know that there is a huge responsibility on their shoulders to gain media attention for the women's game. "I think it's really going to explode after the Olympics," Bonny said, "and we can give that excitement to everybody else." "We really want to perform well and make everyone who's worked so hard to get us where we are proud of us, make the American people proud of us, and represent the country well," Griffin said. "The fact that we are Americans and we put so much emphasis on winning and being the best -- it's really for us trying every day to get better. We're really pushing that limit." An earlier version of this story had a photo with a caption that incorrectly identified Kelly Griffin.